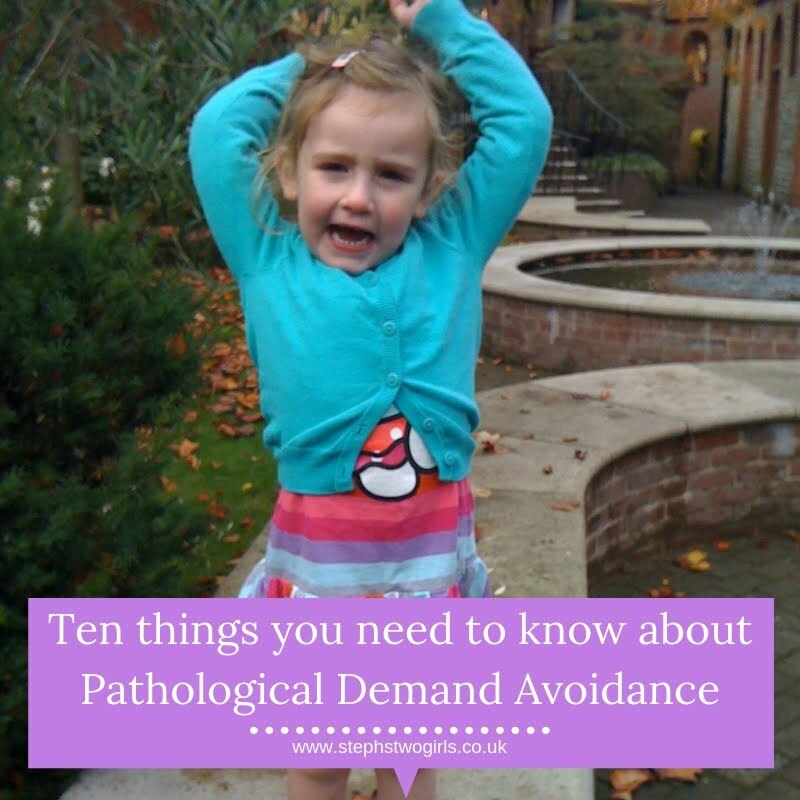 Today is the 15th February, and it's National PDA (Pathological Demand Avoidance) Awareness Day. It's also my mum's birthday (Happy Birthday Mum!) and I'm sure you'll all join me in wishing her a lovely day. 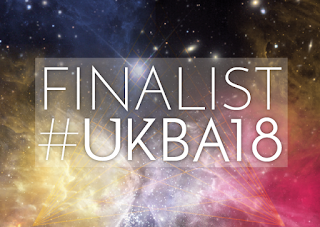 I'd really appreciate it if you could also all join me in spreading the word about PDA - a quick tweet, a Facebook share, blog post comment or share, talk it over with a teacher or professional involved with children, or mention it to someone you know who has a child with challenging behaviour even (but only if you're really good friends, and definitely don't actually diagnose their child, it could of course be a myriad of other factors!). 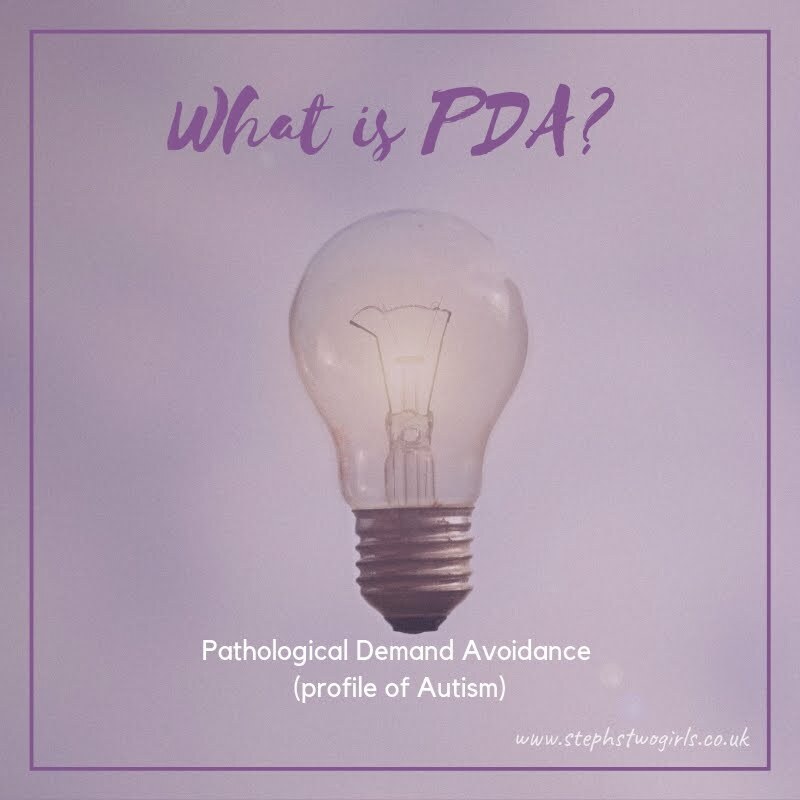 Please point anyone and everyone in the direction of this one specific page www.thepdaresource.com which holds all the important information, from what PDA actually is to resources which can really help families. 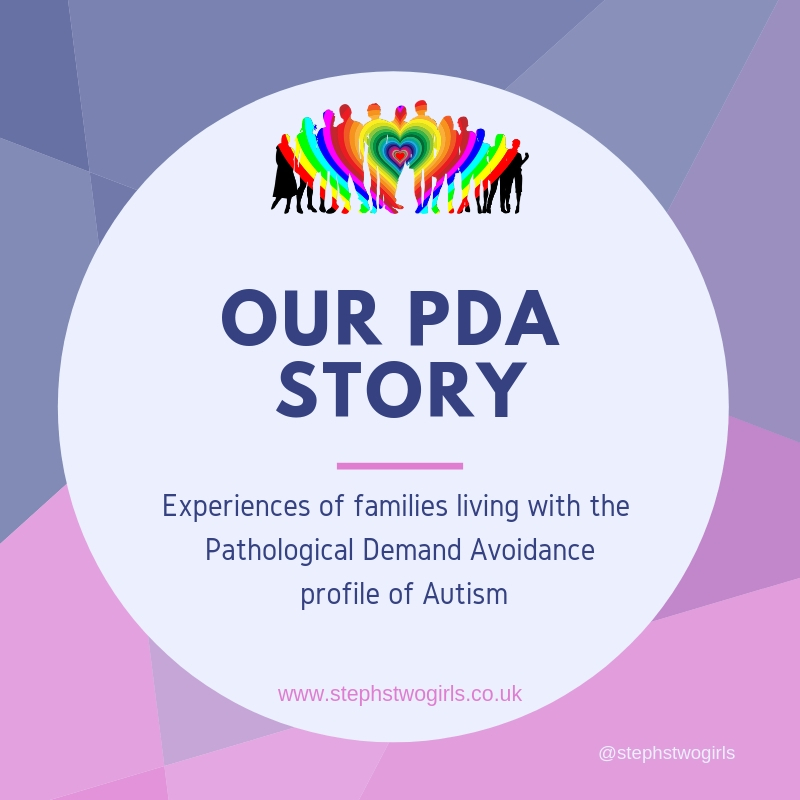 PDA is the particular type of autism that we think our youngest daughter Sasha has. Thanks to a change in the diagnostic tools we may never get that specific diagnosis as there's been a move to just use the umbrella term of ASD (Autism Spectrum Disorder). 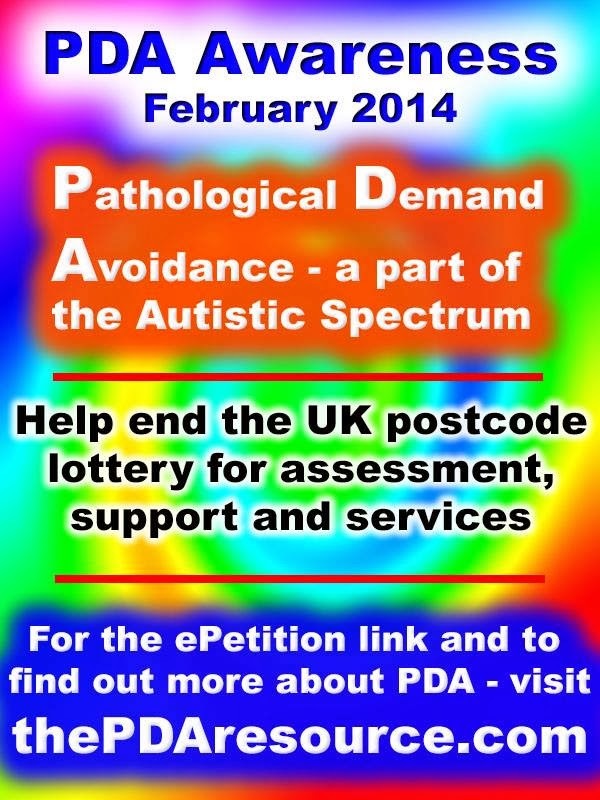 There are others in the UK who have a PDA diagnosis, but as we hear about so many things with the NHS, it's a 'postcode lottery' as to whether you can have confirmation of PDA or not. We are waiting for our return visit to Great Ormond Street, where we have been referred for a more detailed diagnosis for Sasha, but as PDA is a fairly (20 years old) newly recognised condition, I'm not holding out much hope of those words/initials being used. However I'm confident their reports can't fail to mention the levels of avoidance that Sasha used when they tried to carry out their testing on her recently.... anyhow I digress. Parenting a child with PDA is not the same as parenting a 'regular' child. It is way more stressful. I still struggle with using the word 'normal' as I think it's very unfair - I'd be horrified if I heard anyone call Sasha 'abnormal' (or 'irregular' for that matter!). Our life has been made easier by the fact that we do have a 'normal' child, who we can say we have parented in a 'regular' way (note I'm not claiming to be perfect at parenting, but then again, who is?!). 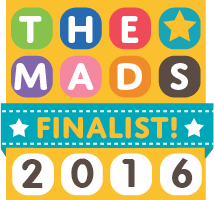 In this world of SEN (Special Educational Needs) that we live in, the 'normals' are often referred to as 'NT' which stands for neurotypical. As in, their brains function typically, like the majority of the population. Since fairly early on after our diagnosis for Sasha, I've always been amazed at how NT children learn so much early on in their journey through life. An example I always give is: who specifically told you not to stand right next to (ie shoulder to shoulder with) the person you are talking to? What is a comfortable personal space? Nobody tells you that, it's just something you learn by watching. Children with autism don't pick up on these subtle visual clues quite so easily, and even when we specifically tell them it might not sink in fully. It takes them longer to learn social rules. For our NT girl, the meetings and detailed reports are not necessary. We do get to see how 'normal' life would be if we didn't have a child with Special Needs, with a hidden disability. Of course I would wish that for Sasha if it was possible, but I've long since accepted it's not. Sasha likes structure, routine and plans, like most autistic children, but she likes to be able to change those at any time she so chooses. She has understood quite a lot of social rules without the specific teaching, which is quite unlike 'standard' autism. She is also very sociable and doesn't have a problem with initial interactions with others (she always says hello to her classmates as she sees them coming up the road)... the problem comes after that, when she wants to be in control of everything, and always be first, and not lose any games. We feel these reactions are largely driven by fear. Fear of the unknown, fear of not getting things right, fear of failure; all of these play a part. Sasha has now learnt after 3 years of school that the teacher is in charge, but she still doesn't want to accept that and lose the control. I'm very well aware that it makes her sound like a naughty school girl, but funnily enough naughty is not a word I would associate with Sasha. She's not really aware that what she is doing could be classed as being 'naughty' - she doesn't intend her behaviour to cause trouble, she's simply trying to stay within her own comfort zone. As Mr C has just pointed out to me, every day is PDA Awareness Day in this house. We live this life of constantly treading on eggshells, trying to be two steps ahead, all the time. There's no break for us, and no guarantee that the ideas we have for making life move along smoothly one day will work the next. It's not just Sasha who has PDA of course; we know of hundreds of parents who have children with PDA (some with a diagnosis, some not), and I'm 100% sure there will be other parents out there who currently only have a diagnosis of autism/ASD but for whom the PDA strategies could really work. This week has been a slightly down one for me, after a few more appointments and meetings about Sasha. She's not changed in any way of course, it's just that I'm becoming more aware of her differences. It hurts. I wish I didn't have to collect her early from school to go to OT appointments, I wish I didn't have to still dress her in the morning, I wish she didn't need 1-1 support for going on a school trip, I wish I could attend an assembly where I knew for sure she was going to 'just' join in, and I wish I didn't have to write notes in advance of a big meeting in a room with lots of people who will all talk about her without her being there. I realise that she's not able to take part in those discussions, but I still wish we could talk with her, rather than about her. I wish she was going to be able to attend a mainstream secondary school but sadly I think that's becoming less likely. I wish there was a suitable secondary educational establishment for her locally, and finding one is going to be the big challenge for me over the next 4 years. In order to gain a greater understanding of Sasha's condition, and the chance to find the right educational professionals who can help her live as ordinary a life as possible in the future, I definitely need help in spreading awareness. 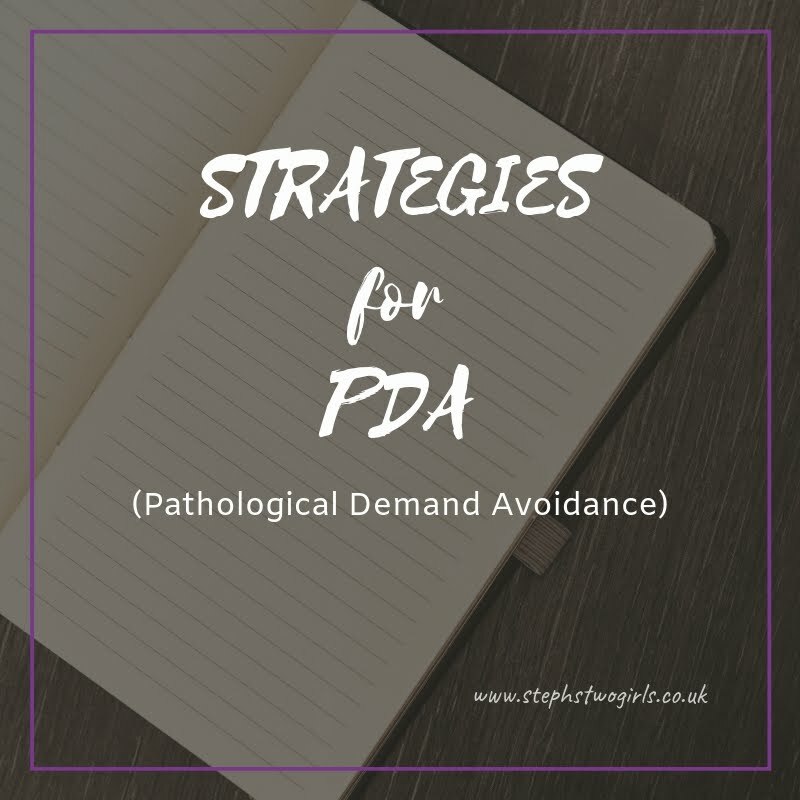 I'd like PDA to be known to more people, and for others to realise that the strategies which we use to help our little girl are not the same as 'giving in' or 'bad parenting'. So please like, share, comment here on my blog or on Facebook, Google+ or Twitter, talk amongst yourselves or in your communities. She also wrapped up a soft toy for her Dad, and hand made a couple of cards for her bestest girl friends at school. My heart has melted this week. She is the most loving and adorable six year old I know and PDA or not, I wouldn't change her for the world. 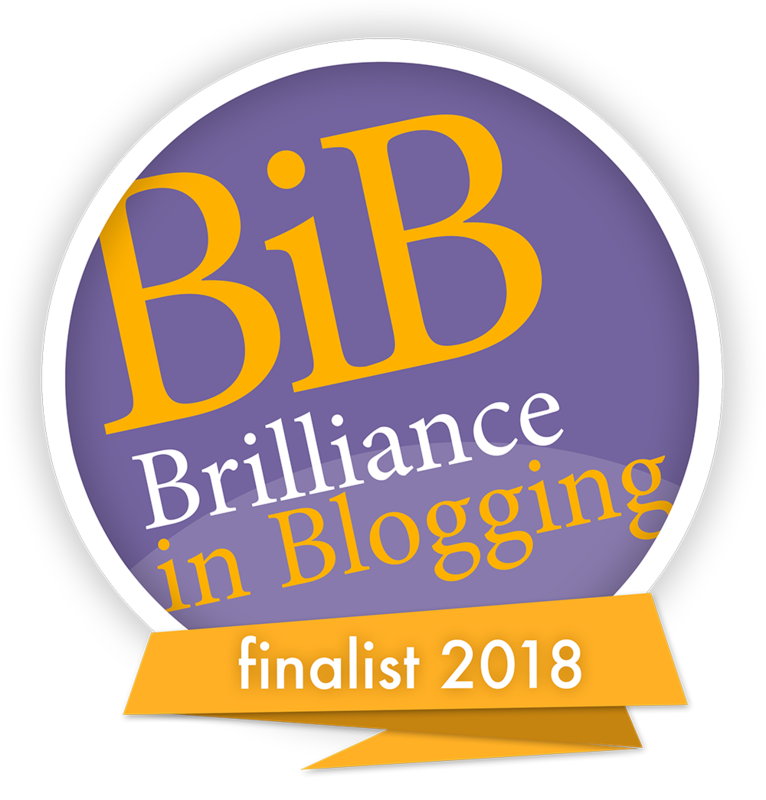 I'm linking this up with #PoCoLo this week as I know the lovely Victoria is very understanding and supportive and I'm hoping all her followers are too!! Small Steps Amazing Achievements - Swimming!